I worked at Cold Stone Creamery for a week in college making cakes. My job was to take an already baked cake, cover it with icing and then draw a design that was already laid out for me. I quickly learned that cake design is no easy task and that I’m really terrible at it. But I’m great at eating cake. Olga Noskova doesn’t have that problem. 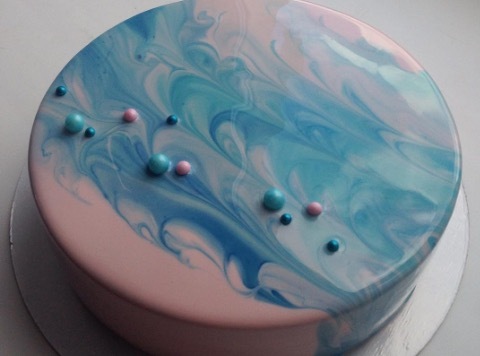 She’s an incredibly talented cake maker who has a massive Instagram following because her cakes are stunning. Like, they’re maybe the most gorgeous cakes I’ve ever seen. This cake would definitely win America’s Next Top Cake Model. The filling on this cake has multicolored sparkles. You know, just in case you were feeling good about your own baking skills. Some of the cakes have fruit on top, which obviously makes them beautiful AND healthy. Have you ever seen such beautiful cake symmetry? Have you ever seen your own reflection in a cake?? Like, I’d actually be mad if I saw someone cut into this cake to eat it. But not mad enough to not eat it. Yes to everything about this cake. She even makes egg cakes. Cakes shaped like eggs. Because why not? Here’s a behind the scenes look at how one particular cake is made.